The first Baptist congregation met in Wem in early 1813, and they took out a lease of a premesis at the end of the High Street, which opened in August 1813. As the premises was small, a chapel was erected in Cripple Street (a short alleyway between Noble Street and Market Street), together with an adjoining house, at a cost of �6, and the chapel was opened on 26th & 27th September 1814. The chapel was described as "very plain and neat", and able to hold 200 worshippers. On Census Sunday 30 March 1851 there were 22 worshippers at their morning service and 45 at their evening one. The chapel was enlarged and "beautified" in 1866. This chapel was replaced by the chapel in the photograph (designed by the architect David Walker of Liverpool and built by Mr T. Francis and Mr H. Tommy of Wem) which was built in 1870-1 on the corner of Market Street and Noble Street at a cost of just over �000. The foundation stone of this chapel was laid on 20th July 1870, and the chapel opened on the 11th April 1871. It had seating for 260 worshippers. 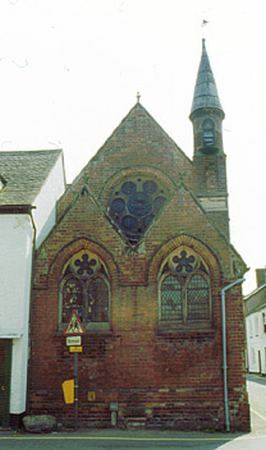 The chapel had closed by 1991 as the congregation took over the former Independent Chapel in Chapel Street in 1988, q.v. All the photographs on this website are copyright and may not be reproduced without the permission of the copyright owsner.